BYRON Bay Rural Fire Brigade Captain Gregg Miller knew instinctively the fire he was heading to along the coast road was "the big one". "When we arrived we knew it was big. The flame wall was huge," Captain Miller said. "It was a very hot, very intense fire." Captain Miller already knew this season was shaping up badly. "It has been very dry and our call rate this year has increased significantly," he said. "We've basically been called out every two days." Camp fires around Seven Mile Beach and Belongil have occupied his crew this summer, but it was a lightning strike that hit near Tobin Close on December 30 that created one of the largest coastal fires seen in close to a decade. The 28 members of the Byron Bay RFS brigade were among 20 local brigades from Ballina, Byron and Tweed who attended the coast road fire, as well as out-of-area brigades from the Clarence Valley and Northern Rivers. At the peak, there were 85 firefighters on the ground, as well as two water carriers working to contain a 16km perimeter fire that ultimately took out 773ha of land. On that first night, the flames reached as high as 50 metres. "The difference this year from previous years is that it's become very dry after the autumn rains," Captain Miller said. "We've had heavy downpours, but the winds have dried things out." The fire will be a wake-up call for the shire, he said. 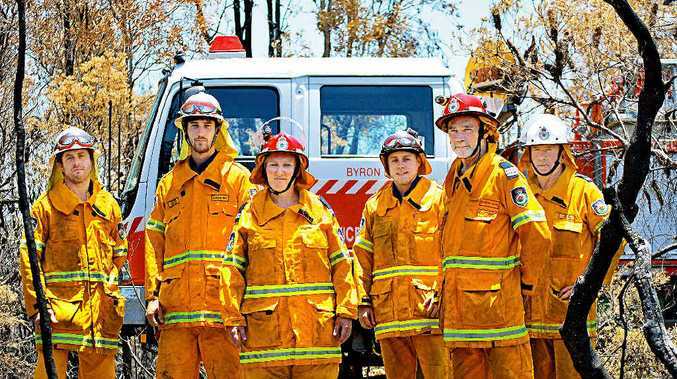 "In my nine years as a firefighter, I've not seen a fire on that scale in Byron." Captain Miller and RFS volunteers have been conducting ongoing education campaigns to prepare local residents. "The RFS's advice is to prepare now, not when the fire is arriving," he said. "I joined the RFS because I had land and I knew nothing about land management and protection. "I stayed because there's great camaraderie. "It's about giving back to the community."